Painted for the sitter's father, William Urquhart, 2nd Laird of Craigston, Craigston Castle, Turriff, Aberdeenshire [Scotland]; by descent to Captain Michael Bruce Pollard-Urquhart [1879-1940], Craigston Castle and Castle Pollard; (sale, Christie, Manson & Woods, London, 20 December 1918, no. 144); bought by (Arthur J. Sulley & Co., London). (M. Knoedler & Co., London), probably from whose New York branch it was purchased 5 October 1920 by Andrew W. Mellon, Pittsburgh and Washington, D.C.; deeded December 1934 to The A.W. Mellon Educational and Charitable Trust, Pittsburgh; gift 1937 to NGA. Painting executed c. 1793; receipt dated January 1794. The coarse, heavyweight canvas is twill woven; it has been lined. The ground is white or off-white, evenly applied and of moderate thickness. The painting is executed boldly and spontaneously, using a wide brush; the paint layers are thin and sketchy, leaving the weave of the canvas clearly visible, and only the sitter's head is brought to a higher finish. The painting is in excellent condition. Retouching is minimal. The synthetic varnish applied in 1980 has not discolored. Preliminary Catalogue of Paintings and Sculpture. National Gallery of Art, Washington, 1941: 160, no. 101. Book of Illustrations. National Gallery of Art, Washington, 1942: 241, repro. 16. Cairns, Huntington, and John Walker, eds. Masterpieces of Painting from the National Gallery of Art. New York, 1944: 136, color repro. Paintings and Sculpture from the Mellon Collection. National Gallery of Art, Washington, 1949 (reprinted 1953 and 1958): 117, repro. Cooke, Hereward Lester. British Painting in the National Gallery of Art. Washington, D.C., 1960 (Booklet Number Eight in Ten Schools of Painting in the National Gallery of Art, Washington, D.C.): 20, color repro. Walker, John. National Gallery of Art, Washington, D.C. New York, 1963 (reprinted 1964 in French, German, and Spanish): 224, repro. Cairns, Huntington, and John Walker, eds. A Pageant of Painting from the National Gallery of Art. 2 vols. New York, 1966: 2:360, color repro. Harris, Rose. 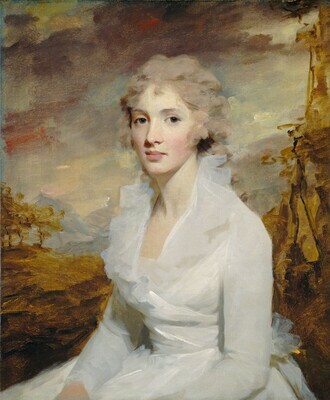 Sir Henry Raeburn. The Masters series, no. 46. Paulton, near Bristol, 1966:5, 7, color pl. 6. European Paintings and Sculpture, Illustrations. National Gallery of Art, Washington, 1968: 94, repro. Walker, John. National Gallery of Art, Washington. New York, 1975: no. 517, 367, color repro. Walker, John. National Gallery of Art, Washington. Rev. ed. New York, 1984: 366, no. 515, color repro. Kopper, Philip. America's National Gallery of Art: A Gift to the Nation. New York, 1991: 60, 67, color repro. Hayes, John. British Paintings of the Sixteenth through Nineteenth Centuries. The Collections of the National Gallery of Art Systematic Catalogue. Washington, D.C., 1992: 196-199, color repro. 198. Hand, John Oliver. National Gallery of Art: Master Paintings from the Collection. Washington and New York, 2004: 277, no. 224, color repro.